The city police force has decided to inculcate values of respecting women in impressionable teenage minds. 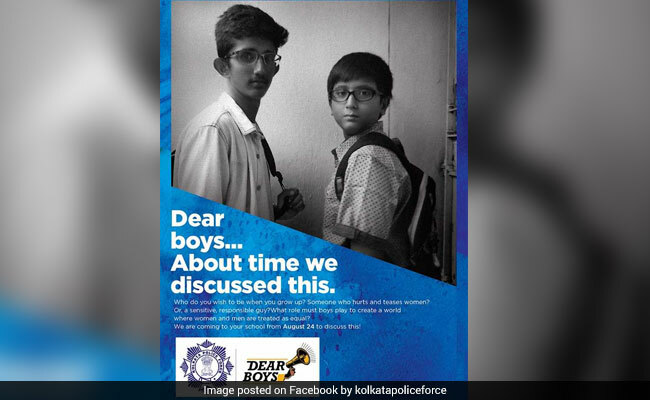 Kolkata: Aiming to educate teenage school boys in showing respect to women, the Kolkata Police have started an initiative named "Dear Boys". Faced with growing incidents of harassment of women on account of their sartorial choices and public demeanour, the city police force decided to inculcate values of respecting women in impressionable teenage minds. "Rather than asking women to wear clothes as per others' choices, return home early to protect themselves from harm, it is better to ask men to change their outlook of women. The 'Dear Boys' initiative is based on this concept," a senior officer of Kolkata Police explained. The community-policing wing of Kolkata Police would reach out to boys studying in classes IX to XII in 20 city schools. "We will visit 10 schools before the Durga Puja. Another 10 schools will be picked up after the Puja vacations," the officer said.